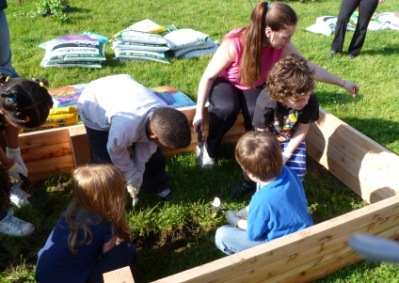 In spring 2012, the Dow Chemical Foundation’s Dow Promise program offered grants totaling more $100,000 to 13 non-profit groups, including a $12,000 grant to Butler University to support a Edible Schoolyard project at the IPS/Butler University Laboratory School. Butler applied for the grant in collaboration with students and faculty of the College of Education, who developed the Edible Schoolyard concept and pilot garden, as a capstone project in an educational leadership course. The Dow Promise program funds projects specifically targeted at positively impacting the educational and economic challenges faced by African American youth and adults in communities where Dow employees live and work. Central to the program is the belief that all students should have access to education. The following story about the grant appeared on an internal news page for employees of The Dow Chemical Company. For Lori Norris, senior director of corporate and foundation relations at Butler University, the Dow Promise grant has generated much excitement because it is literally the seed money for a unique learning program called the Edible Schoolyard. “Our staff, teachers and students are elated that we can move forward and immerse our students in this unique learning experience,” she said. What Lori is referencing is a garden that Butler University and Lab School students planted this spring, and which will be the basis for a large part of the school curriculum tying into math, science, nutrition and environmental lessons. Lori goes on to explain that during the 2011 pilot project, the pre-school to grade 1 classes grew cilantro and basil and learned how to make pesto for a pasta lunch. The Dow funds will expand on this concept and will be used to pay for the garden essentials: seeds, plants, gardening tools, child-size gloves, hoes and cultivators, fertilizer, garden stakes, hoses, soil, compost as well as classroom supplies for the science component of the garden project – computer microscopes, soil samplers and soil kits.